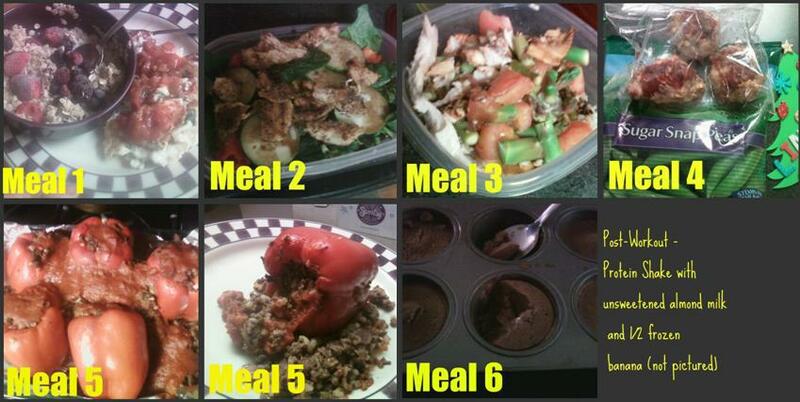 Here is a typical day’s worth of meals for me. 5:30am (Meal 1) – Spicy Egg Whites. 6 egg whites scrambled with 1 big handful fresh spinach, black pepper and 2 Tbsp salsa on top. 1/2 c. old fashioned oats on side with almond milk and 1/4 c. frozen berries. 9am (Meal 2) 4oz grilled chicken (made in bulk on Sunday) over fresh spinach with cucumbers (sliced earlier in week and put in ziploc baggies) and mini peppers. Balsamic Vinegar for dressing with 1 packet Truvia on top. 12pm (Meal 3) Leftovers from dinner last night. 8oz tilapia cooked in pan with in lemon juice, tomatoes, fresh garlic, asparagus, served over 1/2 cup short-grain brown rice (rice was cooked in bulk over weekend). 6pm (Meal 5) Stuffed Peppers with Ground Venison. Ok, this is quite possibly the worst pic ever – sorry it looks like the peppers are throwing up! haha. But, this actually tasted really good. I just threw a two lbs of ground venison in a pan with seasonings (fresh garlic, black pepper, onions, onion powder, garlic powder). Once cooked very well done I added 1 can no-sodium tomato sauce and 1 c. short-grain brown rice (cooked earlier in week in bulk). Cut tops off peppers and stuffed them with the the meat/rice combo. Poured a little marinara sauce on top (you could use spaghetti sauce too, just make sure you check ingredients carefully on whichever sauce you use and don’t use anything with added sugar or oil). Baked in over at 350 for 20 minutes. This probably has a little less starch than you would want in Phase 1 so you could add some more brown rice on the side if you wanted. I know not everyone has access to venison, so you could sub ground turkey instead too. Venison is SUPER lean (I didn’t even have any fat to drain when I cooked this) and probably is comparable to the 99% lean turkey. 10pm (Meal 6) Frozen Chocolate Peanut Butter Egg White Dessert – click for the recipe This is pretty much how I eat my egg whites every night – feels like a big dessert! I eat all six. Thanks for putting the time on this so helpful!